My article today is the fourth in a series of prompts that I hope might spark some creative expression in your kids, and maybe you too. Our first prompt was a general one, where we looked for something else to innovate on, our second took a poem as a model; the third used video as a prompt. I hope you and your kids will join me today so we can all challenge ourselves to be more creative. Maybe just thinking about what we like, discussing it, writing words that come to mind about it, collecting things we like or pictures that represent them will be the prompt that gets us started. If not, can I suggest a walk? Go on a walk to find something you like. Let's say it's a rock. Pick up your rock. Examine it. Close your eyes and feel it. Listen to your rock. What does it say? Is your rock a wishing rock perhaps? Wishing rocks are rare, but it COULD be one. What wish will you make? Perhaps this rock of yours has been around since long ago. Since dinosaur times maybe. What sorts of things has your rock seen and heard and felt? Maybe your rock isn't a rock at all. It's something else. What could it be? How did that something get inside your rock? What if it came out of the rock right now? What would happen next? Responses can be expressed in all sorts of ways: a story, poster, collage, a list, a drawing, a poem, a cartoon. This might be a nice time to explore the texture of rocks by doing some crayon rubbing. If you'd like to go digital, your kids could make a poster online at Glogster or Notaland about their rocks. There was a great article by Catherine Oehlman in Literacy Lava 6 about using story stones with kids. That's another possibility for your rocks. And of course, a rock is just one example. "What I like" is a huge topic. It might be something you keep in the back of your mind until a situation arises that seems ideal eg "I like strawberries, Mum!" What I like is also great fun to do on a child's birthday each year, and keep as a record over his childhood. Teens might not be so keen. I went with the rock idea because I very much liked the concept of a wishing rock. Because I tend to choose words as a way to create, I decided to challenge myself this time, to see if I could come up with a picture of my wishing rock, using digital software. I started in Pages, a Mac program, which, thanks to Kelly Tenkely of ILearnTechnology, I now know I can use to draw shapes and fill them with gradients. I drew a brown rock shape and was quite pleased with myself until my son asked why I'd created a cow pat! Hmmph. I added some rocky texture. Now, how could I make my rock look magical? I decided on a light coming from the top right, and drew lines/shapes which I filled with not much opacity. I desperately wanted some sparkle, so I opened Photoshop Elements, found a star brush and applied some stars to the rock. Then I added some texture to the background, some text and a frame. Was this a vain attempt to stifle the sniggers about magical cow pats floating down the hall, or a vain attempt to conceal lack of skill with bling? In the end, I wasn't much satisfied with the results, but in a spirit of sharing you can see my creation top left. I had to remind myself that with creativity, the process is more important than the product! The truth is, I learned a lot, and it was an interesting and different way to respond to a prompt for me. What about you and your kids? What do you like? And how will you respond to the prompt you choose? I am envisioning a really fun writing prompt activity for the classroom based on your prompt. The weather is still beautiful in Colorado. Wouldn't it be fun to lead students on a journey outside to find a magical wishing rock of their own...although they are rare, I am sure that our playground has just enough for our class to each find their own. Bring those wishing rocks back inside and start to imagine just what brought that wishing rock to them, what has it seen, who else has wished on that rock. Sounds like a fun afternoon to me! Kelly, I'm delighted to read my prompt inspired your own! 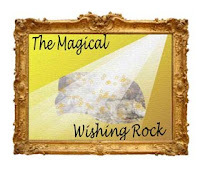 And thanks for liking my wishing rock - I am so thrilled each time I learn a new Mac tip from you. What's wrong with your wishing rock? I love it! And I especially love this activity. It made me think of our stick craft. I wish I would have thought to incorporated this type of creativity with the craft. Another day. Another wishing rock fan! Maybe I just have a tendency to cringe at anything I make? I wonder if I can break that habit?